Huang Xiaoming attended the press conference for his new movie "The White Haired Witch Of Lunar Kingdom" on 2 July 2014 in Beijing, China. 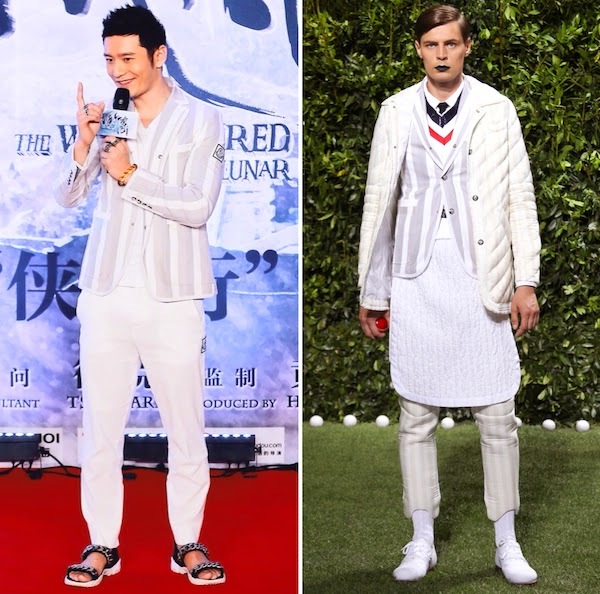 The Chinese artiste wore a grey and white vertical striped blazer and matching white trousers from Moncler Gamme Bleu by Thom Browne. He accessorised with various bold rings and bracelets, and a pair of metal chain details sandals from Givenchy. Huang Xiaoming looked really good at the press conference. His skin looked absolutely incredible. Love the grey and white snap buttons blazer from Moncler Gamme Bleu, I thought it played with the sporty trend very well. Really adore the styling as seen from the runway, but of course it would be too severe for the press conference. Interesting that Huang Xiaoming paired his outfit with the metal chain detailed sandals from Givenchy Spring Summer 2013. The trailer for "The White Haired Witch Of Lunar Kingdom" [白发魔女传之明月天国], starring Huang Xiaoming and Fan Bingbing. The movie is a remake / adaptation of the popular Chinese fable 'The White Haired Demon' [白发魔女传].